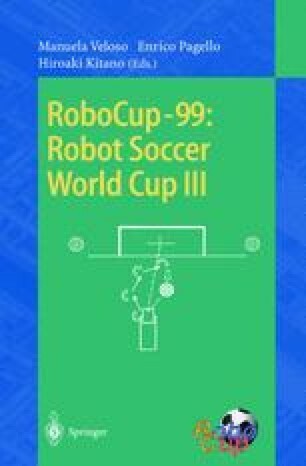 This paper describes analysis results of collaboration among players of RoboCup ’98 simulator teams and on-line adversarial model analysis using LogMonitor. LogMonitor is a tool for analyzing games from logfiles and displaying statistical data such as counts of soccer plays. Evaluation of collaboration in a multi-agent system is closely related with applied domains, which make it difficult to distinguish agent’s universal ability from task oriented programs. In viewing simulation soccer games, play agents’ skills are evaluated from the human soccer standards. This situation is assumed to be similar to collaboration among teammates, that is evaluated from human standards. Adding to the basic actions of the player such as shooting, kicking, etc., a 1-2 pass among teammate agents is used to evaluate teams in collaboration. LogMonitor data shows that 1-2 pass may be useful to evaluate collaboration. Experiments show that adding adversarial information is very useful to make a team more robust.